Sukhoi’s Su-35 will make its first public appearance overseas at the 50th edition of the prestigious air show in Le Bourget. Russian manufacturers will get a chance to display its latest advancements in aviation at the 50th Paris Air Show, which will be held on June 17-23. The show at Le Bourget will feature 27 national pavilions and at least 110 aircraft, among them the Su-35 and the Yak-130. The official spokesman for the United Aircraft Corporation (UAC), Boris Krylov, said: “The UAC will present two combat aircraft in Paris: the Yak-130, produced by the Irkut corporation, and Sukhoi's Su-35. This will be the Su-35's first public appearance abroad.” Krylov added that the aircraft would take part in the show's flight displays as well. The advanced fourth-generation air-superiority fighter jet Su-35 has been designed by the Sukhoi design bureau. Under a 2009 contract, the Russian Defence Ministry commissioned 48 Su-35C (the series name) aircraft from Sukhoi, which are supposed to come into service by 2015. Later the number of the aircraft is expected to double. At the moment, the Defence Ministry has at least 11 Su-35 aircraft worth $85 million each, including three test aircraft. 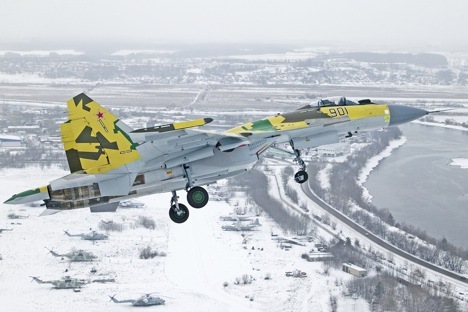 Sukhoi is expected to deliver 12 more aircraft by the end of 2013. The first foreign country to buy the new Russian aircraft is likely to be China. As reported by Russian media earlier, the two sides are discussing a contract for 24 Russian fighter jets to be supplied to China. During tests in late 2012, the Su-35 demonstrated a speed of 2,500 km/hour and a service ceiling of 19 km. The aircraft has a range is 3,400 km and a combat radius of 1,600 km. The Su-35 has a 30-mm gun and 12 wing and fuselage stations with a capacity of 8,000 kg of ordnance. It is capable of detecting air targets at a distance of over 400 km. According to Sukhoi's corporate brochure, the aircraft's distinguishing features include: improved avionics based on a digital fly-by-wire system; a new phased-array radar capable of detecting airborne targets at a large distance; and more powerful and thrust-vectoring engines. Paris Air Show chairman Emeric D’Arcimoles said visitors to the show would be able to once again see an example of Russian-French co-operation, the Russian Sukhoi Superjet 100 civilian aircraft, which has been presented at Le Bourget previously. The space section of the show will feature a new-generation control system for a future launch vehicle based on the Angara rocket, designed by the Scientific-Production Centre of Automatics and Instrument-Making named after N.A. Pilyugin. Famous Russian aerobatic display teams, Russkiye Vityazi and Strizhi, are expected to perform at the Le Bourget show.